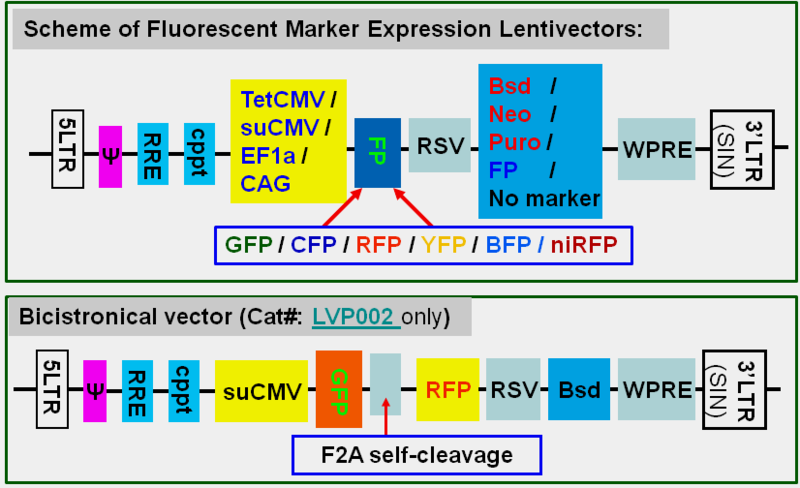 Utilizing our engineered lentivectors and packaging system, GenTarget provides ready-to-use lentiviral particles for all commonly used fluorescent proteins: GFP, RFP, CFP, BFP YFP, niRFP and others. The fluorescent lentivirus are ideal for testing transduction efficiency, cell tracking, stable cell line construction, and enzymatic assays both in vivo and in vitro. They are extremely easy to use with no need for any mixing or addition, and almost no cell toxicity. Simply add virus into cultured cells. You will be able to observe expression in 24 to 72 hours depends on cell types. Each fluorescent protein is human codon-optimized to demonstrate the strongest possible fluorescence signal and expressed under different promoters to best suitable different cell types. The proprietary suCMV promoter demonstrates the highest expression level in the majority of cell types. The engineered EF1a promoter is non-tissue specific, highly expressed in all cell types, and less likely to be silenced after long-term culture. The CAG promoter–a hybrid of the CMV enhancer and chicken beta-actin promoter–has the highest expression level in embryonic stem cells. The optional inducibleCMV promoter (TetCMV) can be used as either a constitutive high expression or tetracycline-inducible express as desired (click to see those products page). Different antibiotic marker for selection flexibility. In DMEM medium with 10% FBS and 60 µg/ml polybrene. Concentrated, purified, and buffer exchanged into PBS for use In Vivo or for serum sensitive culture. Click each color above to see each sub-category products, or see all product from Product Manual (.pdf). 2008 ~ ©, 2019 GenTarget Inc. All rights reserved.